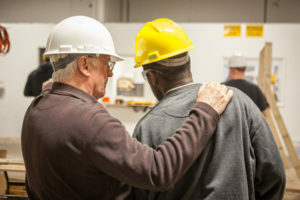 In 2005, JOTF theorized that Baltimore City residents who were unemployed with significant barriers to employment could thrive in the building trades if provided with the right combination of industry training and supportive services. Over the last 12 years we have proven this theory to be true. Just last month, Project Jumpstart enrolled its 50th class of participants. Since 2006, JOTF enrolled over 1,000 residents with over 800 completing the full scope of JumpStart training. Over the last 12 years, 75% of those graduates who completed were placed into employment with an average starting wage of over $13/hr. Approximately 30% of those jobs were connected to a formal apprenticeship in one of the building trades – setting our graduates on the path to a professional license in high-wage and high-demand industries. The graduate from the very first class of Project JumpStart who became a licensed electrician and recently became an apprenticeship instructor. The graduate who was working in fast food, enrolled in JumpStart, and is now earning six figures working in the construction industry as a project manager. He also became one of JumpStart’s instructors. The Iranian immigrant who was operating a taxi service when a passenger told him about Project JumpStart. 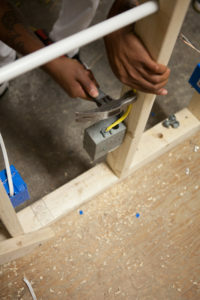 He is now a licensed electrician and part owner of a residential construction company. There’s also the graduate who came to JumpStart at 24 years old, working part-time at a car wash after having just been released from six years of incarceration. He is now a licensed sheet metal mechanic and has been trained to mentor young adult program participants. All of these stories and countless others may have started with Project JumpStart but they were written by our graduates’ grit and determination to overcome the barriers placed before them. Just this past spring we watched 12 JumpStart graduates complete their 4-year apprenticeship program through Associated Builders and Contractors. Our graduates made up approximately 15% of ABC Baltimore’s graduating class, which serves the entire Baltimore Metro area. In an industry with a 7:1 White to African-American employee ratio in Baltimore City perhaps the most important highlight of that apprenticeship graduation was that 11 of the 12 JumpStart graduates were African-American. While 11 people will not dramatically change an industry overnight – Project JumpStart is making significant, intentional strides towards eliminating employment access barriers to ensure more equitable representation in the construction industry. Project Jumpstart has become more than just a small program helping Baltimoreans obtain jobs in the building trades – it’s about supporting people to create the future they want to build for themselves. To learn more about Project JumpStart – please contact Program Manager Matt Stubbs or donate to support the program.